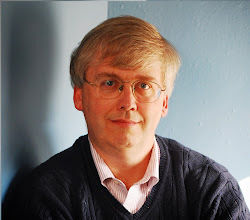 John Schmitt discusses "Low-wage Lessons" in a January 2012 paper written for the Center for Economic and Policy Research. 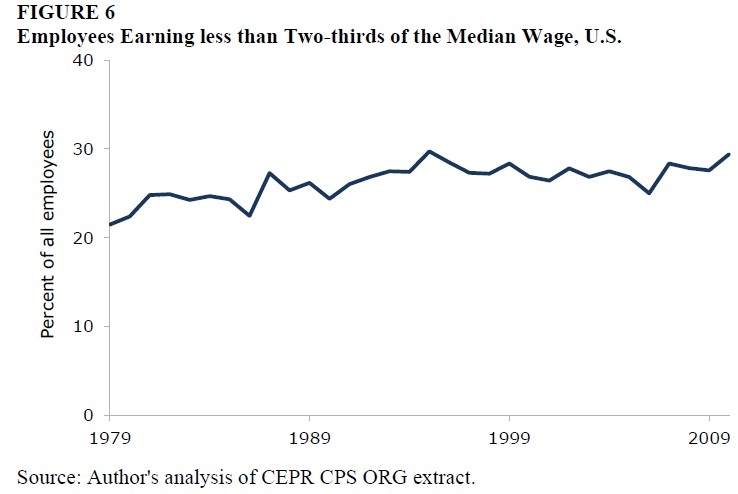 Define "low-wage jobs" as those that involve earning two-thirds or less of the median hourly wage: that is, those earning less than about $10/hour. 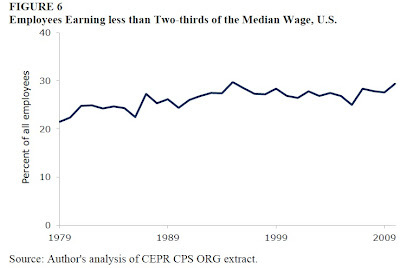 As Schmitt notes: "If low-wage work were a short-term state that helped connect labor-market entrants or re-entrants to longer-term, well-paid employment, high shares of low-wage work would be less of a social concern. Indeed, if low-wage work facilitated transitions from unemployment to well-paid jobs, countries might want to encourage the creation of a low-wage sector to improve workers’ welfare in the long term." On the other side, if low-wage jobs are a near-permanent state of affairs for a substantial group of workers, or if such jobs even send a negative signal to potential future employers that this worker is going to have low productivity, then the prevalence of low-wage jobs may be of real policy concern. Given the rising levels of inequality in the U.S. economy in recent decades, it's not a big surprise that the share of workers who can be classified as "low-wage" has been rising, from about 22% of the workforce in 1979 to about 28% of the workforce by 2009. 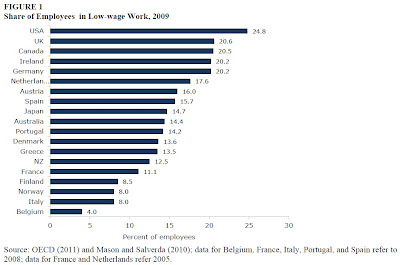 Moreover, the share of U.S. workers who are low-wage is considerably higher than in many other high-income countries. 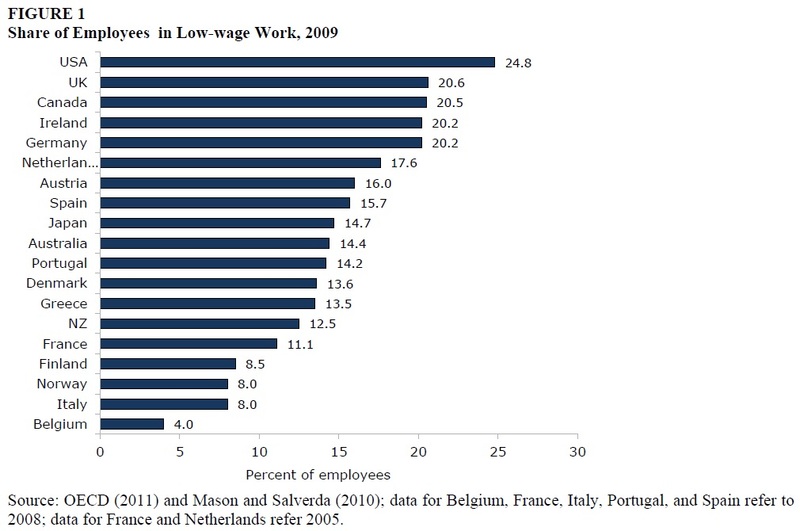 About one-quarter of U.S. workers are low-wage, compared with 20-21% in the UK, Canada and Germany; about 15% in Japan; and 8% in Norway and Italy. The issue here can be summed up with this question: If someone in the U.S. economy is a law-abiding citizen who works full-time for a period of years, can they earn a level of wages that let them afford a slice of middle-class standard of living? If you are earning $10/hour and working 2,000 hours per year, your annual earnings of $20,000 would put you below the poverty line of $22,891 for a single parent with three children. And the problems of low-wage work aren't limited to low wages. Schmitt writes: "Not only are low-wage workers likely to stay in low-wage jobs from one year to the next, they are also more likely than workers in higher-wage jobs to fall into unemployment or to leave the labor force altogether. ... U.S. labor law offers workers remarkably few protections. U.S. workers, for example, have the lowest level of employment security in the OECD and no legal right to paid vacations, paid sick days, or paid parental leave. ... [M]ore than half (54 percent) of workers in the bottom wage quintile did not have employer-provided health insurance and more than one-third (37 percent) had no health insurance of any kind, private or public." It's worth noting that labor force participation rates for men aged 16-24 have fallen from 72% in 1990 to 57% in 2010, and for men from 25-54, the labor force participation rate has fallen from 93% in 1990 to 89% in 2010, according to Bureau of Labor Statistic data. Much of this is due to the low pay available to those with low skill levels. Schmitt only sketches his policy suggestions here, which include higher rates of unionization, higher minimum wages, employment-protection legislation and other national labor laws, along with higher benefits for the jobless and low-income households. He less of a fan of the Earned Income Tax Credit, fearing that employers capture much of the benefit of the credit because it allows them to pay lower wages than they otherwise would. For my own part, dramatically higher rates of unionization would fly in the face of a half-century trend in the U.S. (see this post for some details). While I'm comfortable with the minimum wage playing some role in the labor market, jacking it up by 50% or more seems to me unwise. I'm an enthusiastic supporter of the EITC, and a cautious supporter of certain national legislation to improve employment benefits and conditions. But my purpose here is not to argue policy, but only to point out that the U.S. labor market seems to be producing an outcome where a substantial and growing proportion of full-time employees earn barely enough to creep above the poverty line. If we wish to build a society and an economy on rewarding work, it is a harsh fact of U.S. labor markets that such a reward is currently not apparent for many.